The chairman of one of South Korea's largest conglomerates, SK Group, has been sent to prison for three years after embezzling company funds. Son Kil-seung, 63, was charged with illegally drawing more than $680m (£373m) from the group for private investment overseas. He was also found guilty of evading taxes and bribing politicians. In addition, he gave $8.7m in illicit campaign funds to the main opposition party ahead of the 2002 election. Allegations of corruption and financial mismanagement has brought SK Group and its sister companies to the point of bankruptcy several times, forcing the firms to rely on state bail-outs to survive. 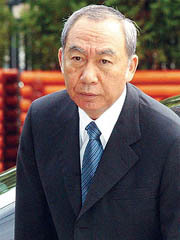 Son stood down as the group's chairman in February. After months of wrangling and a widening scandal, the creditors of South Korea's trading firm SK Global have agreed to put the firm into receivership. 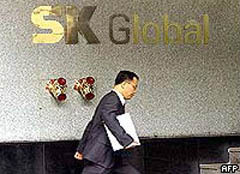 SK Global has been on the verge of bankruptcy since a 1.5 trillion won ($1.2bn; £720m) accounting fraud was uncovered in March. The trading firm is a subsidiary of SK Group, one of South Korea's largest chaebols, the family-run businesses that control much of the economy. The fate of SK Global has been seen as a test of President Roh Moo-hyun's drive to reform corporate accountability at the family-run groups. Several attempts at bailing out SK Global have failed. Most recently, foreign creditors refused to agree to a debt swap arrangement between South Korea's largest oil refiner, SK Corp, and its stricken sister firm. An official at Hana Bank, SK Global's leading lender, said the decision to put SK Global into court receivership was inevitable after local creditors failed to agree with their foreign counterparts over the firm's debt rescheduling. Hana Bank said the other main domestic creditors of SK Global had unanimously agreed that receivership was the only remaining option facing SK Global. SK Global's total debt stands at 9.93 trillion won ($8.4bn) at the end of June, according to Hana. Under court receivership, a firm is usually allowed to freeze debt repayments until the court decides whether to liquidate the company or not.